Note: the following column contains some sensitive material. Reader discretion is advised. Support for abortion can be undercut when people learn what an abortion actually is. An enterprising young pro-life woman, Lila Rose, is working hard to solve this problem. She and her team at liveaction.org have been producing powerful online videos to educate people as to what actually happens in an abortion. The videos are going viral in a major way and are receiving tens of millions of views. I had the privilege this last weekend to hear Lila Rose as she addressed the Values Voters Summit in Washington, D.C. (put on by Tony Perkins and the Family Research Council). She spoke about their latest video project and its incredible viewership. The video project can be found at www.abortionprocedures.com. 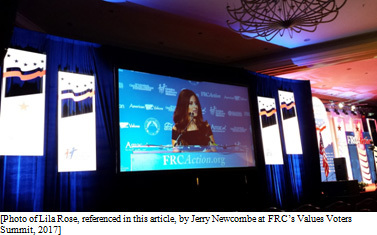 What the abortionists do in secret, Lila Rose aims to shout from the housetops. When you visit the landing page of these videos, you have five menu choices. They are: D & E, aspiration, pills [e.g., RU486], induction, and "the story." The first four videos deal with common forms of abortion. The D & E is addressed below. Aspiration refers to the high power suction type of abortion performed on first trimester unborn babies – with suction machines 10 to 20 times more powerful than a vacuum cleaner. The "induction" method is performed on preborn babies, 25 weeks and older, and through the use of injection, they attempt to induce cardiac arrest of the unborn baby – who, at this stage, feels pain. These videos are hosted by Dr. Anthony Levatino, an OB/GYN; and "the story" menu item features interview segments with Levatino himself. How did he, who once performed over 1,200 first and second trimester abortions, change, and why? In one of the videos, he says, "One day, after completing one of those abortions, I looked at the remains of a preborn child whose life I had ended, and all I could see was someone's son or daughter. I came to realize that killing a baby at any stage of pregnancy, for any reason, is wrong." Levatino also says, "I will no longer do any more abortions. When you finally figure out that killing a baby that big [about eight inches long – based on his hand gestures in the video] for money is wrong, then it doesn't matter if the baby is [large or tiny] – it's all the same. And I haven't done any since then, and I never will." Consider the D & E video, which refers to Dilation and Evacuation, where the second trimester unborn baby is dismembered, limb by limb. In this video, Levatino shows one of the key tools of the abortionist, saying, "This is a sopher clamp. A sopher clamp is made of stainless steel. It's about 13 inches long. The business end is about 2 ½ inches long and a ½-inch wide, and there are rows of sharp teeth. This is a grasping instrument, and when it gets a hold of something, it does not let go. The abortionist uses this clamp to grasp an arm or a leg. Once he has a firm grip, the abortionist pulls hard, in order to tear the limb from the baby's body. One by one, the rest of the limbs are removed, along with the intestines, the spine, and the heart and lungs." He continues, "Usually the most difficult part of the procedure is extracting the baby's head, which is about the size of a large plum at 20 weeks. The head is grasped and crushed. The abortionist knows he has crushed the skull when a white substance comes out of the cervix – this was the baby's brains." Levitano then goes on to explain the potential risks to the woman having an abortion, truths presumably buried in the fine print of the release forms they sign before the procedure. Thankfully, these videos are educating millions of people. Lila Rose told me in a text message (10/15/17): "On Facebook and YouTube, the four videos have a combined 85 million views." 85 million views? CNN, call your office. It's a new day when an independent pro-life organization can manage to gain that kind of viewership through social media alone. Live Action asked some of their viewers for one-word responses to the abortion procedures described in these films: "barbaric," "SATANIC," "MURDER," "Horrifying." Lila Rose is not about condemning those who support or have supported abortion, but rather changing hearts and minds by presenting the truth about it, one video at a time. Dr. Anthony Levatino says in the D & E video, "I want you to know today, no matter where you're at or what you've done, you can change. Make a decision today to protect the preborn."